Learn how the Drip integration works with the built-in Abandoned Cart feature for OCU! 1. Open a new window/tab in your web browser, then navigate to the Drip.com website and log in to your Drip account. 2. Click on the Menu icon (three dots) in the upper-right corner to open a drop-down menu. *IMPORTANT: If you haven't integrated your Shopify store yet, then click on Integrations and choose Shopify to integrate your Drip account with your Shopify store. 3. Open the drop-down menu in the upper-right corner. Click on Account in order to open the General Info screen. 4. Find and copy your Account ID found in the bottom field. 5. Open the OCU app on your Shopify store and paste your Account ID into the Account ID field in the Drip section. 6. Navigate back to your Drip account, then click on User Setting in the drop-down menu. 7. In the User Info form there is an API Token. Copy your API Token. 8. 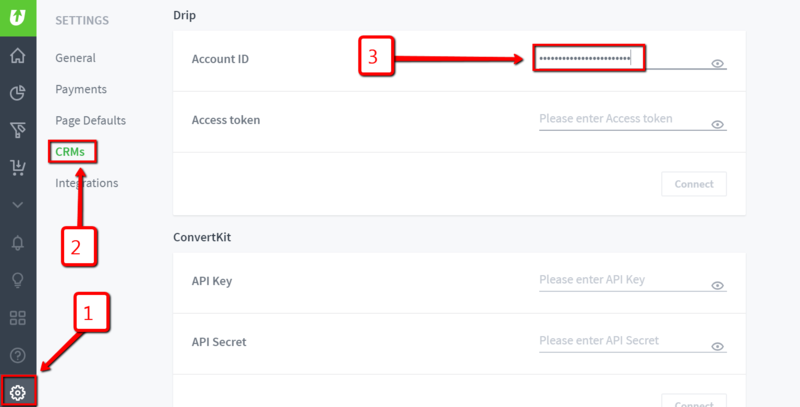 Return to the OCU app on your Shopify store and paste your API Token into the "Access token" field in the Drip section. Then click the green “Connect” button. You're done! Note: Check to make sure that the Integration with Shopify is on/active. When you have your Drip.com account connected with your Shopify store, then all customer events like Customer created, Customer updated, Updated a custom field, Order created, Placed an order and others are created by your Shopify integration. The OCU integration works to pass the "Checkout updated" event with some customer properties when the customer abandons the OCU checkout. This information can be used in the Cart Abandonment Workflow. Value, total_discount, currency, abandoned_checkout_url, line_items, name (checkout token), accepts_marketing and source (OCU). Click on the “Campaigns” tab and then click “New Campaign”. In the pop-up enter your Campaign name. Create your email using a Blueprint or by creating your own email from Scratch. Your own email can be created from Scratch by clicking the “Create Your First Email” button. You can add the checkout_abandoned_url which will be the same entity for the event passed from the Shopify integration and the event passed from the OCU integration.